In 1985, Victoria celebrated its 150th anniversary with a range of events held throughout the State. In October of that year, Prince Charles and Princess Diana joined the festivities. The royal couple were met by crowds of adoring fans when they touched down at Tullamarine Airport on the 23rd of October. 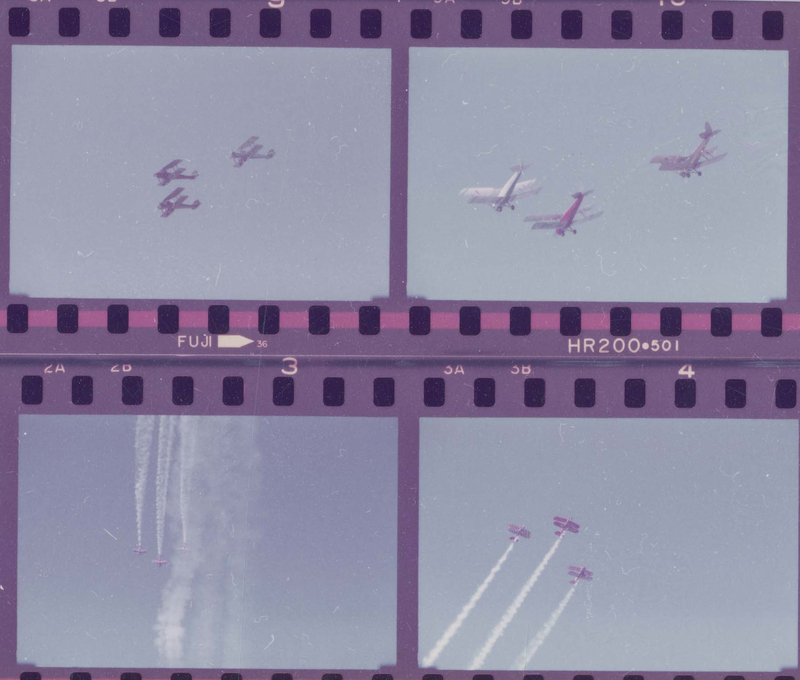 In our Melbourne Harbour Trust collection of photographs you can find sets of negatives from the Melbourne Bay Day Sailing celebration they attended at Port Melbourne, which featured an aerobatic air display by the Royal Australian Air Force’s Roulettes team. 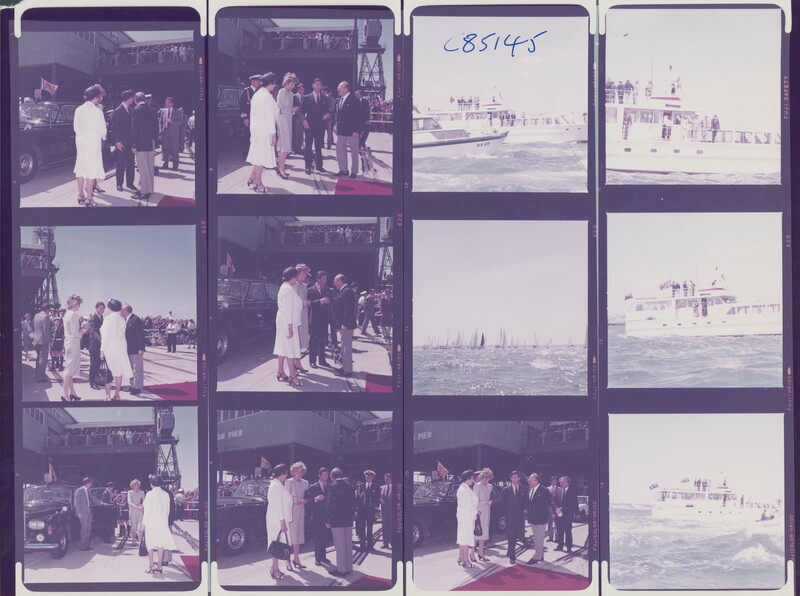 Charles and Diana are featured amongst these photographic negatives from the Melbourne Harbour Trust, vprs8357 p1 unit9 item3/008. It appeared a picture perfect sunny day with the royal couple aboard the Commissioner while bands played on the docks and the planes performed their tricks overhead. “War planes slurped air into their booming engines and the water fizzed with boats. It was a battle Royal on Port Phillip Bay. Sails, fat with wind, flicked as boats collided and skidded past each other. There were at least 600 craft circling like wagons on a patch of water that would have been jammed by 50 boats. Frantic crews and captains cursed each and water police bellowed orders. But their shouts were sucked into the engines of a Hornet — Australia's new tactical fighter — as it split the air during a flying display. The recommissioned steam tug Wattle, carrying press and television crews, was almost rammed and reporters ran for cover when the bow sprit of a large ocean-going yacht poked like a long pencil into the seating area. “The Prince and Princess of Wales were at the centre of the swirl — the calm eye of the hurricane. They waved gently from the deck of the M V Commissioner as smaller craft careered passed,” Debbie Cameron, The Canberra Times, 3 November 1985. 1985 was the couple’s second official tour of Australia, and came just one year after Harry was born. 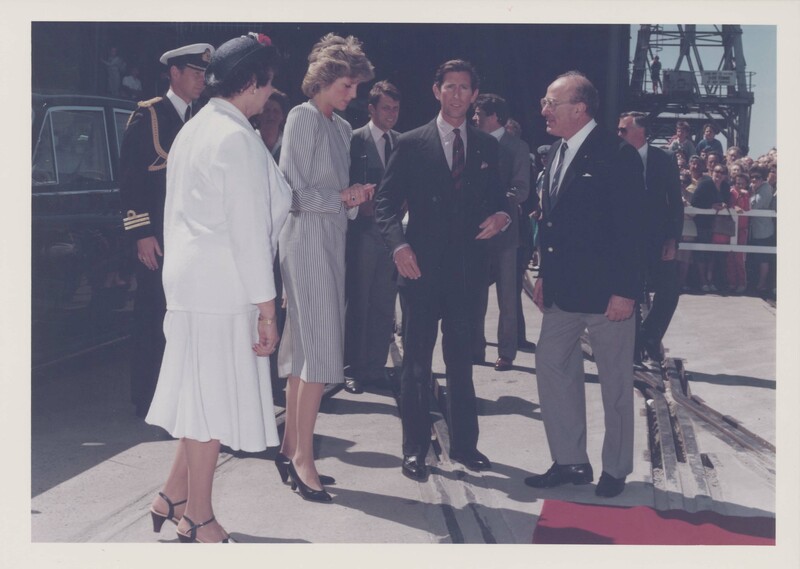 Charles and Diana arrive for the day's festivities at the Port of Melbourne, vprs8357 p1 unit 9 item3/10. Diana and Charles, vprs 8357 p1 unit 9 item3/008. Diana and Charles on the Commissioner, vprs8357 p1 unit9 item3/008. The flying troupe performing tricks, vprs8357 p1 unit9 item3/008. The rest of the tour included visits to regional Victoria as well as bushfire affected regions. There were also parties and concerts to attend, like the charity ball at Southern Cross Hotel where Charles and Diana famously danced to Isn’t She Lovely during the night. While in town, the royal couple of course made time to attend the Melbourne Cup on the 5th of November. Of course the newspapers couldn't let the event pass by without commentary on what Diana was wearing. She caused a bit of a stir in an outfit she’d been seen in at previous race meets around the world – Ascot and Florence. “She looks nice… but really, darling, a new outfit would have been marvellous,” said one onlooker in The Canberra Times, 6 November 1985. Prince Charles presented the Cup to the winning jockey of What A Nuisance, Pat Hyland, and famously joked that the Cup should be overflowing with Fosters. The couple visited Australia again in 1988 for the Bicentennial Australia Day celebrations. It was their final visit to Australia as a royal couple. 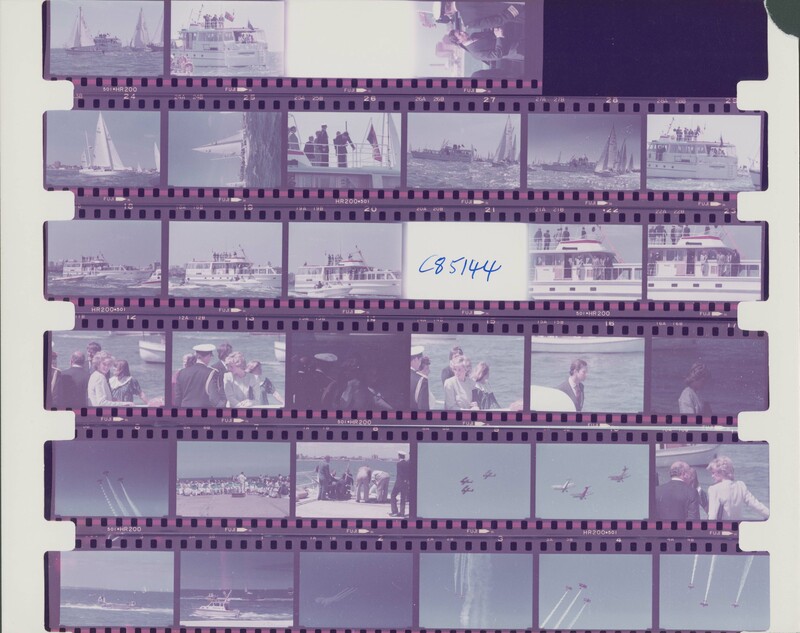 More negatives from the collection, vprs8357 p1 unit9 item3/009.